Will Nike Raise Its Dividend in 2019? After strong performance last year, shareholders hope the athletic footwear specialist will be more generous. Check out the latest Nike earnings call transcript. 2018 was a good year for Nike (NYSE:NKE), as its stock posted a total return of nearly 20%. Even though the athletic footwear and apparel company has seen a lot of competition lately, Nike was able to fight back and keep its primary overseas rival at bay. That helped restore Nike's supremacy atop the industry. As much as investors love good returns, they also like to see healthy dividend yields, and that's one area in which Nike consistently loses the race. Yet the company did manage to deliver a dividend increase in 2018, and that has shareholders hopeful that Nike will keep being more generous with its cash both this year and beyond. Below, we'll look more closely to see if Nike's likely to keep boosting its dividend in 2019. It might not look like it when you focus on Nike's dividend yield, but the athletic company has put together an impressive track record of dividend performance. The stock has paid higher dividends each year for the past 17 years, and Nike doesn't give token hikes, with double-digit percentage increases being the most common. Last year's 10% boost continued a string of $0.02 per share raises in Nike's quarterly dividend payment dating back to 2014, and similar percentage increases prevailed before then. NKE Dividend data by YCharts. The reason Nike's yield looks so puny is that its stock's performance has been even better. Over the past decade, Nike's dividend has risen by more than 250%. But its stock has produced a 650% increase in its share price, and that's had the impact of dramatically reducing Nike's yield. That's not bad news for long-term investors -- it just makes the current payout look less enticing for those who are new to Nike. Over the past year, Nike has made a lot of progress restoring its reputation as a champion in the athletic apparel arena. After losing some of its momentum in overseas markets in past years, Nike refocused its efforts on key international markets like China and Europe, and the return of strong growth in those regions has helped lift Nike's overall numbers higher. It also managed to get sales in the key North American market moving upward more sharply, and near-term projections have Nike carrying that positive momentum into the new year. Moreover, Nike has been able to tap into a key trend that could produce even more benefits down the road. Rather than relying solely on intermediary retailers to sell its products, Nike has made big investments in building out its direct-to-consumer channel, both through physical retail locations and with its e-commerce assets. The higher margin levels the direct business produces have been a boon to Nike's overall profitability, and shareholders expect those favorable trends to continue. 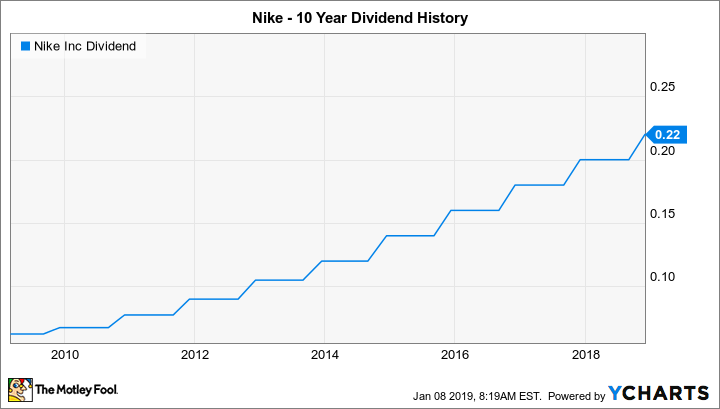 Can Nike keep raising its dividend in 2019? Nike's capital allocation strategy puts a lot of emphasis on share repurchases, with a recent $15 billion authorization for buybacks over the next four years demonstrating the company's commitment to returning capital to shareholders in that way. Yet with plenty of earnings room to boost dividends as well, I'm optimistic that Nike will accelerate its payout increase in 2019 to a $0.03 per share boost, making the quarterly payout a round $0.25 per share. That won't give Nike a big yield, but it'll show that the athletic giant still takes dividends seriously.